Is your website broken? If so, what can you do to fix it? Tune in as James Schramko and expert WordPress website developer Dave Wooding talk about this and more in this first of a 3-part Website Tune-Up Series. 04:18 – Have you embraced the change yet from desktop to mobile? 07:19 – Update or replace an old site? 22:41 – How does your website stack up? 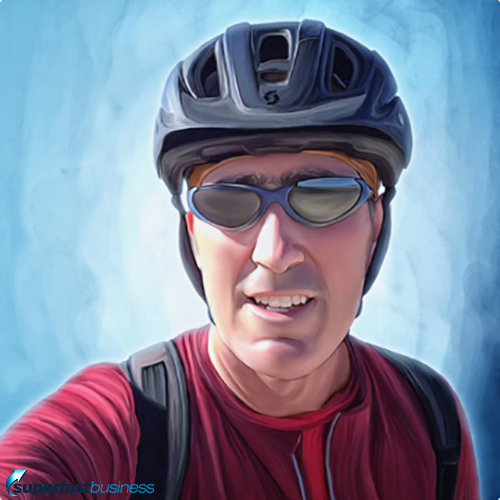 Running an online business is more than just having a great website. Click HERE for coaching. 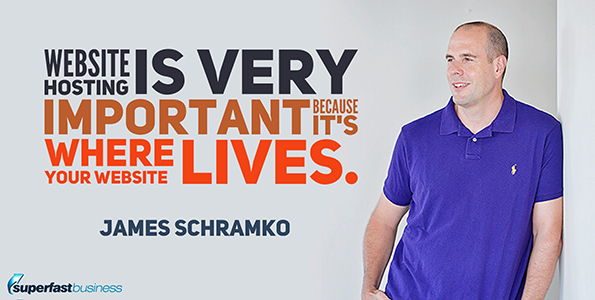 James: James Schramko here. Welcome back to SuperFastBusiness.com. In fact today, I have a very special guest, someone who I’ve been friends with online for a decade now. Welcome my good friend, Dave Wooding. Dave: James, thank you very much. It’s a pleasure to be here. James: Now you’re not known for doing podcasts that often. So I consider it a huge privilege that you’re coming to share your genius with us in this Website Tune-Up Series. This is a three-part series. The goal of this is to approach this from the perspective of where we need to be with our website. In this series, we’re going to cover some of the things that people often come to your service with your services called RecommendWP. It’s a website development company that I used to own actually. A great team, and you took it over, and they’re doing great work. They’ve built thousands of websites. So we’re going to cover some of the things that people come to you with that’s broken. That will be the first episode. The second episode, we’re going to go beyond basics. We’re going to look at how you can start getting better results from your website. And the third part will be the website supercharge. This is the advanced ninja level, black belt type stuff that you really want to be getting going with your website to extract the best from it. So that’s what we’ve got in store for this three-part series. Dave, are you ready to get down to business? James: OK. So when we had a look at all of the support queries and the types of jobs that the team over at RecommendWP have been doing, one of the things that’s been coming up a lot is people are presenting non-mobile friendly websites to you and asking for help. So let’s first of cover, why is it so important that our website works on mobile? Dave: Yeah. Mobile is probably the biggest issue we see for people that just show up and need to get facts. And really it’s because most people nowadays are viewing your website on a mobile device. So if your site is not showing up properly, it’s not rendering, or anything like that, it’s definitely an issue. Also, if you want to have advertising where you send people to your site or even SEO, having a site that’s mobile-friendly is very important. James: Right. So what can we do to check if our site works on a mobile? Dave: Well the easy thing of course is simply load it up on your phone and hopefully it’s obvious. Alternatively, you can go to sites. I think Google has a page insight site that’ll check how mobile-friendly your site is. Another one is called GTmetrix.com. If you were to go there, put your site in there, it’ll give you some feedback on the site’s performance, and it’ll give you some options or tell you what needs to be improved to be make it better performing for mobile sites. So a couple of sites like that are good to find out, kind of a baseline, where you’re at with your site. But, pick up your phone, look at your site. I’d like to think it’s obvious. If not, go visit one of those two sites that I recommend. James: Yeah. I know I’ve visited shops to buy things and they’re impossible to use on a mobile. It would be foolish to have a site that doesn’t work on mobile. I’ve been pretty fussy about that to the point where I know the team actually developed websites around the mobile first. That’s been a big change. We’ve seen the tipping point where more people are using sites for mobiles. I know that Apple are very popular. You definitely want to be working on an Apple iPhone because so many people have them. James: So we know why it’s important. We know how to check if it’s broken. What’s the actual, technical process that is undergone with the team when they turn a site from a desktop version to a mobile version. I think it’s worth explaining this because sometimes people wonder what does it cost a bit to turn a site into mobile-responsive. I think if they know why, this might be helpful. Dave: OK. So when we turn a site into a mobile-friendly site, we’re going to look at what you currently have. And typically, we’re going to move it over to a WordPress solution if it’s not already on WordPress. And if it is on WordPress, we have typically things that are available that are mobile-friendly by default. So it’s a matter of pouring over your current content into a WordPress theme that’s mobile-friendly. For the most part, most things these days are. There still are some things that are not. It’s smart to stay away from those as much as possible. Additionally, we’ll resize images as needed, make code adjustment to handle the different screen sizes; the difference between like an iPad and an iPhone, those are different screen resolutions, and those need to be accommodated for. Either through special code and or a combination of using a WordPress theme that are just for that kind of stuff automatically. WordPress has gotten really good about putting that stuff behind the scenes if you will. There’s not much you have to touch. However, it’s a matter of getting your content, getting your images, all the things you want to add to your site into a WordPress theme that’s mobile responsive and making the appropriate adjustments to make that happen. James: Right. So in other words, you’re making a kind of multiple versions of the same site so it’s going to react differently depending on what is looking at it. Dave: Exactly. So the browser can detect like the screen size. So it can make it adjustments on the fly to the way information is presented. For instance, you might have a site that has a main content area and then a sidebar on the right or left-hand side. If you show that on a mobile device, typically it will show the main area at the top and then move the sidebar to the bottom. So that’s kind of the magic that happens behind the scenes automatically when you’ve got a responsive theme that can handle that. Again, that’s the kind of things that people need to have on their sites so that they’re readable. My eyes aren’t as good as they used to be. And a lot of times, if I’m looking at my iPhone, I actually have to turn it sideways in the landscape mode to be able to read what it says there. On a good responsive site, not an issue. It just happens automatically if you will on the background. James: Right. That’s good to know. So we’ve covered mobile, why we should have it. I’m guessing in some cases it’s going to be easier for somebody to just adapt a new theme than to try and repair an old one. They could certainly ask your team if they need an assessment on that. What the likely cost would be to update an old site versus replacing it right? Dave: Right. Absolutely. That’s why we and I think other providers are good about giving options. On one end, you could pick from a collection of themes and basically get them modified to your site. Or you can go the total opposite direction and fully customize it, get a design done, get the images ready, and then have somebody like our team code it up so it looks exactly the way you designed it. So you’ve got those choices outright and that range of choices are available. James: Very cool. So let’s have a look at the other thing that’s often broken. Partly, this is a price-led thing. We often see people asking questions like, “Where can I get good, cheap hosting?” Website hosting is very important because it’s where your website lives. As you know, SuperFastBusiness.com is hosted on a dedicated server with LiquidWeb. There are a number of other providers out there. What sort of challenges have you seen with hosting, and how do we even know if we have a hosting problem? What are some of the typical issues people are going to be experiencing? Dave: By far, the biggest one I think is just a slow-loading site. I mean if your site takes a few seconds to render, there’s a problem. Going back to what I spoke about earlier, GTmetrix will come in, it can analyze your site, it gives you an idea on how fast things load. And the best use of that in my opinion is you type in your domain, you click submit, you let it do its thing. It’ll give you some grade. That’s not the important part. 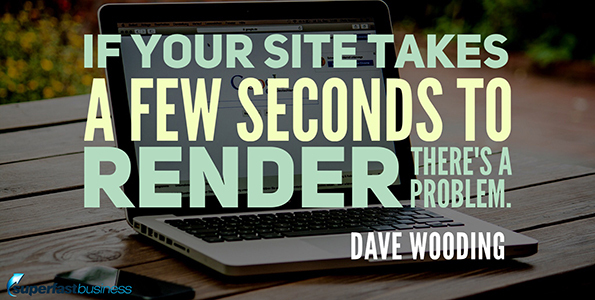 The important part is how long does it take your site to load. If it’s less than three seconds, that’s good. Even better is from there, you want to click on the waterfall view and then look at the very first line. How long did that take? And if it’s less than half a second, which is 500 milliseconds, that’s good. If it’s above that, above a second, there’s definitely a problem with your hosting. There’s something set up either wrong on your hosting or not proper, or you’re on a shared server that has 50,000 other sites that are hogging resource. So it’s a good way to know right off the bat if you’re going to have an issue with your site. The other thing there is you might have images that are just monster images. You gave an image to a designer or you put up an image that’s just huge. It takes up the whole screen. Well guess what? You need to resize that prior to putting it on your site so that it doesn’t take so much space up and takes a long to deliver. Can you imagine opening your iPhone, sitting there waiting, waiting, waiting, until something finally starts to show up? It’s doubtful people are going to stick around long enough to find out what the problem is. So if you’re smart about it, you’re going to make sure that the site loads quickly. GTmetrix can tell you that. And then typically, it’s either going to be a hosting issue, either they are overloaded on that server and you might want to consider upgrading to like a VPS, Virtual Private Server, or even a dedicated server, where yours is the only site on that. And then typically the next thing is image sizes. It’s great to have this super, wonderful, desktop-size images, but they do need to be minimized for mobile devices. So those are usually the big things with regards to hosting, and then secondary, the images that impact how your site performs. James: Right. With images, how do you make them smaller? Dave: The team knows how to do it. They’re using software basically to shrink the images down ideally without losing the quality and the transparency if it’s a certain type of image. But yeah, we typically have software that takes care of that and somebody else pushes those buttons pretty well. James: Nice. So basically when it comes to hosting, you’re either on resource that’s not good enough to deal with your site or you’re using the resource in an intensive way that is putting unnecessary load on it. Imagine you’ve got a whole bunch of things that you can go and check to make sure that the site is loading in the correct order, the files are in the correct places, that files are a certain size, and you can compare the server that you’re onto perhaps a high-quality test server where you know you’re going to get a great experience. In fact, I remember we used to have that. Sometimes we develop a site and it was amazing. And then we’d export it to the customer’s hosting and it would slow down. That was a sure sign that the hosting resource was not appropriate for the site. Dave: Right. That’s exactly what I was going to mention. Like you, we have a development site or development server. We move all the customer’s site over so that we don’t break anything on their site or touch it while it’s live and do all the work on ours. Sometimes what we do is we actually run it through GTmetrix, get the speed, all that stuff, move it back to the customer’s server and then measure the speed again, and it becomes pretty obvious if there’s an issue right there. But like you said, if you move it back to the customer’s server and it’s not performing as well as it was on the development server, you’ll know that more than likely, there’s an issue with the hosting. That’s why we move everything to our server in a controlled environment, do the work and move it back at a time that’s convenient for the client and then take a measurement, see if there’s any significant difference in the performance. In that way, if there are issues, we could figure out where they are. James: And you’ll help the customer move their sites around. James: Because I know it’s not something I enjoy. I always had someone to help me. Dave: Yeah. That’s why we have kind of a well-defined sequence of events that we do, and a customer. We take on a customer so that we can deliver expected results. If we just did all the work for instance on the customer server, how would we know if there was a server issue? If we didn’t compare it to something else. So the advantages are for the customer that they don’t get their work interrupted and we have a way to gauge where any issues are and doing all the work on our site in a controlled environment so that nothing breaks. I’m not a fan of breaking something live and having to get up at midnight and fix it. James: Perfect. Do you keep backups of websites? Dave: Oh yeah, we do. Typically, after a certain amount of time, we’ll archive them to a service like Amazon S3. But least for a few months, they sit on our development server so that if anything does go wrong on the customer’s site, for instance they got hacked and something was broken or something went down, “Hey, we have a copy by the way.” So it’s available. Yes, we do archive their sites for a while live and then we back them up even further onto Amazon S3 later in the future. James: Perfect. Now, the next thing that you get that’s broken, sometimes the design just doesn’t look quite right. It’s like it’s been hacked at a little bit at a time overtime or little bits of pieced added on here and there or a widget for some opt-in plugin. It looks like kind of a Frankenstein thing. What do you do in that situation? Dave: Well, I’ll give you scenario that just came up recently. A client came to us telling us that every time they updated WordPress, his site would break. Well that’s not good. So what we found out was the person who had done the work for him before had actually gone in and made modifications to the core WordPress files to get the effect they wanted. They didn’t do something smart like create a child theme, make all the changes there so that when WordPress updated, nothing would break. So that’s scary to me that somebody would do that. Obviously not really understanding that you don’t want to touch the core, you want to do it outside of there and make it an add-on or a child theme. We’ve done enough of those to recognize when they come up. That’s part of the why for instance we offer pre-done themes that we will then modify using a child version of it so that we don’t break the core. It just bothers the mind sometimes how certain people will go in and make adjustments. And sure, they got it done quickly in an hour or two but it’s going to cost the website owner time and money down the road. So not recommended to do it that way. James: So I think this is part of the issue in an industry where pretty much anyone can call themselves a WordPress developer. Any number of people on jobs boards in all different countries, different price rates. But I do see people constantly posting, looking for someone good on this jobs boards because they’ve had an experience where they got cheap but not good and things might have been band-aided temporarily but they’re not something that you would build your business around for certain. I mean just to give some context to this, I’ve been working with you now for a decade online, and you’ve been able to support me with helping build my communities, my forums, the APIs involved in helping those forums talk with the shopping cart and to create special dashboards and tool sets and to join up all of my websites. So I have utmost confidence in your programming skills and I know when I’m dealing with a business like yours that I have someone I can go back to and ask for help if I break something or if something changes and it no longer works. I think that sort of peace of mind is worth paying a premium for because you just don’t know what you’re getting when you dip your hand into the Fiverr jobs board. I always like to understand what people’s end goal is. Someone’s end goal might simply be to keep it simple. They want a site that’s simple for them to use, for their customers to use, for everything. Another person might be completely dialed in with, “I want this thing to convert. I want everything dialed in to be related to conversion. Even if it’s super complicated, that’s what I want.” So oftentimes, it’s a matter of getting to understand the customer’s needs as much as possible, either through email/support, or a Skype call or even a phone call. Those things are important because in the long run, if you do go cheap, that might work. You’re gambling I think a little bit. If you’re savvy, you have enough experience, you’ve dealt with providers before, you know what exactly to look for, that’s probably best. On the other hand, if your time is valuable and you happen to be working on the infrastructure is costly to your business, it’s probably better to find the person who knows what they’re doing, ask the right question, challenges you on what you’re asking for, gives you the pros and cons, that kind of stuff. Anyway, that’s kind of the point is you’re going to get what you pay for, there’s definitely people that will promise the moon and deliver little to none or deliver something that will eventually break without anticipating what your needs are. For instance, if somebody wants an easy setup, you have to kind of think down the road. What if they do this? What if they do that? What if they want to make this change? What we’re doing now, is it going to keep that thought in mind later on in the future? James: One thing that comes to mind, I remember way back when I was looking at a custom shopping cart, the solution was going to cost tens of thousands. I think it was $30,000 and several thousand dollars per month. I had a conversation with you and I shared with you what I’m trying to do and in the end, we worked out that Nanacast actually covers all of the things I wanted to do except for one thing and it wasn’t that important as it turned out. In the last seven or eight years, I’ve used that solution, which people can get for a hundred bucks a month. I think that advice was very valuable to me. It was more than $100,000 worth of advice based on what it would have cost me. I think in this episode, we’ve been talking about broken things. A lot of people coming to you for help probably got the wrong solution because they didn’t put in the wrong questions or get the right advice in the beginning. This episode is really primarily to clean up some of the messes that you are either currently making or could make. So just a quick recap, make sure your website is mobile friendly, make sure it’s hosted somewhere where the resources are appropriate for the website. Make sure that your look and feel is in line with what you’re trying to do and that you haven’t created some Frankenstein monster that breaks every time you update it. And a good solution there is just to update it to a new mobile-responsive theme. Always check your site on the development server to see how it’s performing to compare with your own. Have a look at how you can speed up the site by rearranging things to load in the appropriate order and make sure that your images are tuned up by your developer to make them as small as possible without distorting or losing the image quality. Dave, you mentioned a few good resources there. GTmetrix.com is obviously one of your favorite ones to go right now, this is the action step. And run your site through a few of these tools and start with GTmetrix.com and see how it’s performing. If you find out you need a hand with your website, get in touch with the team at RecommendWP.com. 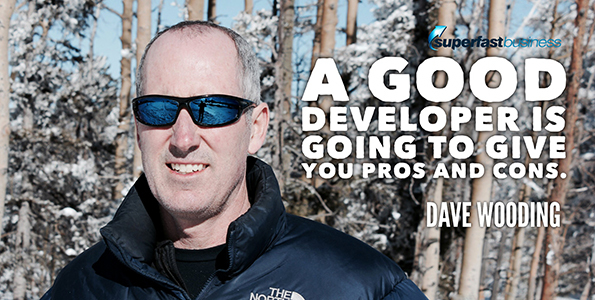 Dave and his team will be happy to help you out with your development requirements. Dave, thank you for joining us on this episode. I’m looking forward to the next episode where we’re going to go beyond the basics and we’re going to talk about the next level of things we can do once our site is no longer broken. What can we do to make it even better? Dave: Excellent. Thank you James.